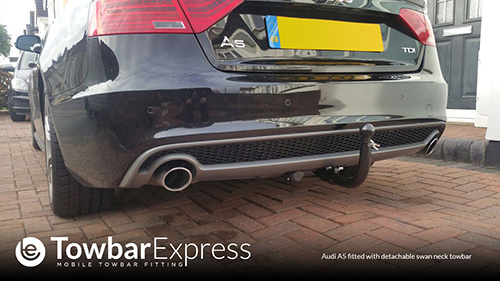 At Towbar Express our Audi A5 towbars are specially designed to mount to the fixing points on your car that are specified by Audi and are Type Approved where necessary. Our Audi A5 towbar collections include flange towbars and detachable swan necks - so you’re bound to find one to match your exact needs. Our towbar fitters can come to your home or place of work to carry out the fitting. We like to save our customers time in their busy schedules, so we work around your day. You can select and customise your preferred style of towbar below, or if you're not sure which one matches your car, just enter your registration number and postcode in the search above. All of the prices shown below include professional fitting at your home or work. We employ all of our towbar installers, and we will not just contract out the work to a 3rd party company or a self-employed towbar fitter. The Audi A5 has been produced by German car manufacturer Audi since March 2007. The A5 range comprises the coupé, cabriolet, and "Sportback". It is based on the same platform as the Audi A4 saloon and estate models. The first generation A5 (Type 8T) is known as the B8 family, while the second generation 2016 model is based on the B9. Both are derived from the Volkswagen MLB (Modular Longitudinal Matrix) architecture. Although it is based on the same chassis as the Audi A4, the Audi A5 needs a slightly different towbar due to the design of the bumper, so the towbars are not transferrable. Our range of towbars includes the fixed flange and swan neck designs. The swan neck towbar is also available as a detachable option. The 2007- 2016 B8 model has a maximum towing weight of up to 2145kg, and the newer B9 model can to up to 2100kg. in order to fit a towbar and small cut is required on the underside of the bumper, but this is as discreet as possible. 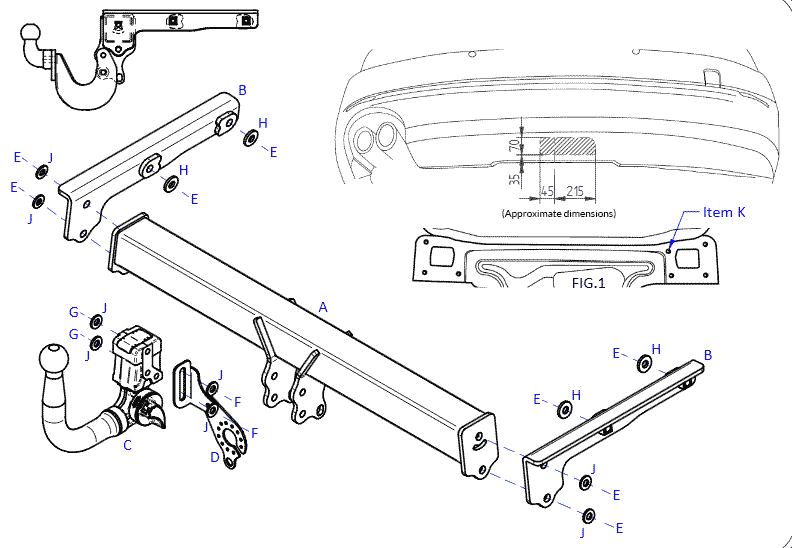 The image below shows an example towbar for the B9 model.